If you are reading this article that means you are seeking the best CMS for your project that too from the two most popular choices Drupal and Joomla. Isn’t it? Well, you have come to the right place. The thorough comparison between Drupal Vs Joomla 2019 will show you a better picture to choose the one for your project. Generally, bloggers reckon Joomla as an intermediate while correlating it with other two giants of the web industry WordPress and Drupal. It is a general notion that WordPress is the easiest one and Drupal is the complex one, which is good enough for complicated and enterprise-level tasks. And as far as Joomla is concerned, it is flexible bearing out of the box features that can manage a large volume content and have an easier learning curve. No matter if you are a blogger, freelancer developer or a professional developer, you need a perfect content management system that should be competent enough to take your business to the next level. It should be functional and flexible. Everyone prefers a CMS that is more than just its basic functionalities. Here at Templatetoaster website builder, Let’s pore over all the aspects such as differences, similarities, features, ease of use, security, SEO, scalability, performance, customizability, and support in this post of Drupal Vs Joomla. The main objective of this blog post is to clear the confusion and help you take your decision to choose between Drupal Vs Joomla 2019. Talking about Drupal, it is a free and open source content management system. And you may use Drupal to create complex digital frameworks. You may enhance your Drupal website with the available add-ons and Drupal theme frameworks. Drupal sites are highly secure and stable. People use it in every sector such as personal blogs, corporate sites, political websites, and even some of the government websites also build with Drupal. Drupal is fit to handle the complex jobs with its easy to use web interface that lets you handle the range of content types. The option to deal with users accounts and user permissions makes it even secure and reliable. Joomla is a free and open source framework. It is considered one of the best powerhouse CMS that allows you to create strong online stores. Joomla helps you build highly interactive websites and eCommerce applications with the help of Joomla template frameworks. You will get tons of free and premium extensions with Joomla to make your website unique and powerful. The Joomla Extension Directory is filled with such robust extensions to boost up your site. Joomla allows you to easily manage your media files with the help of a tool known as a media manager. So, this was a little introduction about Drupal and Joomla. Let us now begin with the real comparison to decide which CMS is better between Drupal Vs Joomla. Let’s first study the comparison table given below. Drupal is free and open source CMS powering millions of sites and applications. Drupal is written in PHP. Joomla is free and open source CMS. Joomla is a model-view-controller (MVC) based web application framework. Drupal requires you to be technically proficient. Possible to create the most advanced sites with Drupal. Joomla is less complex than as compared to Drupal. It’s easy to understand Joomla’s terminology and architecture. Since it has a strong API so best suited for complex websites. Any type of websites. Let’s now begin with the detailed comparison. Nowadays most of the hosting companies offer one-click installation for almost all the major CMSs. And many tools are available that helps you install a CMS yourself using a service like Bitnami or Softaculous. However, the manual installation gives a better understanding of how the software is being installed on your system. It is easy to understand the flow. But, I would still suggest not to take a chance if you are not very technically fluent. Drupal has a total of 6 steps of installation. And every step is easily accessible if you have technical knowledge. Consider Drupal Forum if still get confused with how to install Drupal. As we know that we may install Joomla with one-click installation so nothing to worry about. However, if you wish to install it manually even then it is not that tough. First of all, configure the Joomla site, then, set up the database, and finally, finalization process. If by any chance you get stuck somewhere in the process of how to install Joomla you may visit the huge support forum i.e. the Joomla Installation Forum, to get a solution for yourself. Drupal is a more technically advanced CMS option. If you are good at PHP, HTML, and CSS then you won’t find it difficult to work with Drupal. And making changes to your web property would be like a breeze. Whereas, if you are not very tech-savvy then it might take a long to make any useful change in your site. And this apparently makes working with Drupal a little tougher as compared to Joomla though it has a WYSIWYG editor. Drupal has a steeper learning curve which create the problem you if you have to hand over the website to one of your newbie clients. Joomla has an incredible balance between the array of features and the ease to use these features. It lies somewhere between the WordPress and Drupal when it comes to complexity. See this comparison between WordPress Vs Joomla Vs Drupal and know yourself. Joomla has a user-friendly interface and easy management. Similar to Drupal, Joomla also has a WYSIWYG editor. But, the editor is integrated within the complex layout which is hard to understand for a novice user. However, there are a lot many easy options to use available with the dashboard. Be it any CMS, security is the top-most priority for any web developer or a user. Many websites store user information with or without the user’s consent. So, to avoid such data breaches you need a highly secure CMS. And luckily Drupal and Joomla both are highly secure platforms. If you ever come across any unknown attack or security breach which you are unable to handle, visit the Drupal forum where millions of people have registered their experiences. And from here you easily get an answer to your problem. with the help of experienced professionals. SEO is one of the main concerns for any website owner. Search engine optimized website are still the ones who attract the most organic traffic. No search engine such as Google, Bing, Yahoo, etc. ever care about which CMS your website is built with as long as it is delivering the potential content to the users. And Drupal offers you in-built caching for blazing fast page load time. The page load time does effect on your website’s SEO. In order to improve your site’s SEO, you should always keep the Drupal SEO guide handy. So, whenever you need to find any tip or module, you can refer it. Drupal offers you many responsive themes to make your site looks good on smartphones, tablets, and PCs. Managing a Joomla site’s SEO can be quite difficult. Because Joomla rewrites the URL to add the keyword in the page and address. Likewise, at times it’s difficult to manage title tag optimization and meta description as well. It gets more complicated in the case of Joomla to employ SEO practices. Any novice user might have to struggle to get the right SEO for his website. To ease the process you can refer to these convenient Joomla SEO extensions. And believe me, these SEO hacks can set your Joomla site’s SEO to another level altogether. Performance is such a factor that can attract millions of users to your website and at the same time, it can annoy your users. Obviously, if your site’s performance is poor, the users will leave your site and will look elsewhere. And I’m sure you don’t want that. Well, nobody does. Basically, performance is related to how fast a page loads in your site. Your site should be as fast as possible to keep your users on your site. Needless to say that a CMS plays an important role when it comes to performance. Obviously, no two CMSs comes with identical functionalities and this is where Drupal varies from Joomla. Drupal is highly-scalable and easy on resources. And Drupal is smart enough to handle your website whenever it faces gridlock. And this evidently makes Drupal the best option for a large and heavy website. 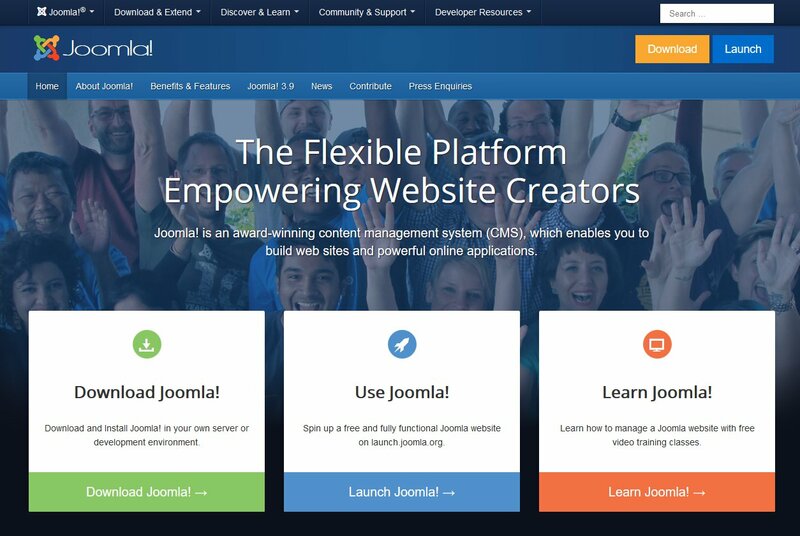 Joomla, on the other hand, is more lightweight and optimized content management system. Joomla is considered one of the best CMS in terms of performance. It offers you in-built performance-boosting feature. Follow these tips to improve Joomla website performance in no time. To get your Joomla site at the right front you need to make sure you use optimized images, minimum and optimum plugin usage to make your site load quickly. You can also go for Joomla specific web hosting for better performance. To set up the desired website you require a CMS that supports easy customization. Whereas, the level of customization totally depends on the choice of your content management system. Because every CMS has their own level of customizations. And both these CMSs Drupal and Joomla are highly customizable and truly versatile in nature. Drupal, being an open source platform still sets you free to customize your Drupal site as per your requirements. However, you can create a Drupal theme from scratch with TemplateToaster without any technical knowledge. Sounds great yeah!! With thousands of extensions available it gets really simple for any user to include whatever functionality they want to add to their website. You will see various theme options offering your desired practicalities. It only depends on you, how quickly you find a theme that fits in your requirement criteria. Professional web developers having working experience of Joomla and Drupal know the fact that Joomla and Drupal both are highly customizable at their core. However, TemplateToaster makes it really simple for every Joomla user to create Joomla template with its amazingly easy to use interface. How important a support factor is? Very much! Well a CMS that offers a large community makes it easy for its users to get resources and support effortlessly. Needless to say that Drupal is community-based content management system, therefore, if at any time and anywhere you feel bogged down, simply visit the community for your answers. You will receive the expert opinion with strong answers here for whatever issues you have. You will get help from the experienced users and professionals. As I have mentioned above that Joomla and Drupal both are community-based CMSs so, you will get a large community here in Joomla also. Joomla too has a great support structure with the expert panel. You will get an official help portal, where you can ask your technical questions and you will soon receive your answers. Though the community is not as big as other two giants (WordPress and Drupal) but still you will quick revert. You can refer to Joomla documentation for more clear understanding. This brings us to the end of this post and I am sure by now you must have obtained thorough knowledge about these two powerful CMSs. However, choosing the best CMS for your site totally depends on your site requirements. Pick a content management system that suits your requirements, that offers you functionalities which you need to achieve your goal. Overall, Drupal has a lot many privileges but it demands some professional expertise to get them right. However, Joomla is comparatively a bit more beginner-friendly. 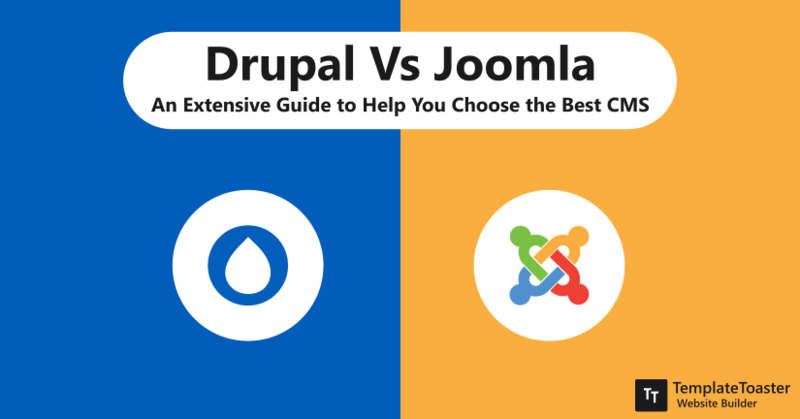 I hope you find this post helpful to make a choice between Drupal Vs Joomla. Don’t forget to share your thoughts with me in the comments below. Stay tuned for more.